Prime Minister Benjamin Netanyahu has announced that he will chair a new ministerial committee on combating domestic violence, even though his government failed to budget funds for such a plan proposed by an earlier task force. Netanyahu’s announcement drew criticism from Joint List MK Aida Touma-Sliman (Hadash), who heads the Knesset Committee on the Status of Women and Gender Equality. The Communist MK accused him of ignoring the growing phenomenon for years and pointed out that the very government he heads recently voted against a proposal to establish a parliamentary commission of inquiry on violence against women. According to official figures, so far in 2018, 21 women in Israel have been murdered by their spouses, partners or other male relatives, a 30% increase from last year. About half of the victims from the last two years had previously filed complaints with the police about the violence inflicted upon them. The data reveals that more than 13,000 women have been treated for physical abuse from their partners this year, with an average of 50 domestic violence cases opened each day. 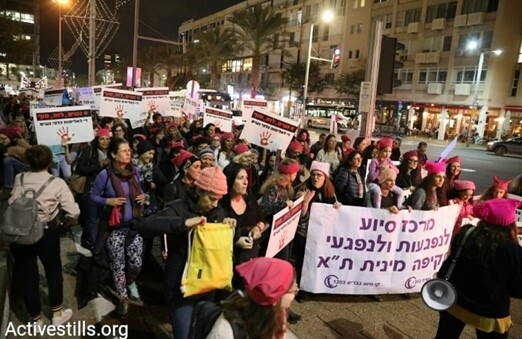 Some 2,000 protesters took to the streets in Tel Aviv on Sunday evening to mark the International Day for the Elimination of Violence against Women; other demonstrations commemorating this day were held earlier in Jerusalem, Haifa, the Negev and Kafr Qasim.